Dean A. Preston, Commander of the 133rd Engineer Battalion, dismisses the unit at homecoming ceremonies at the Augusta State Armory. 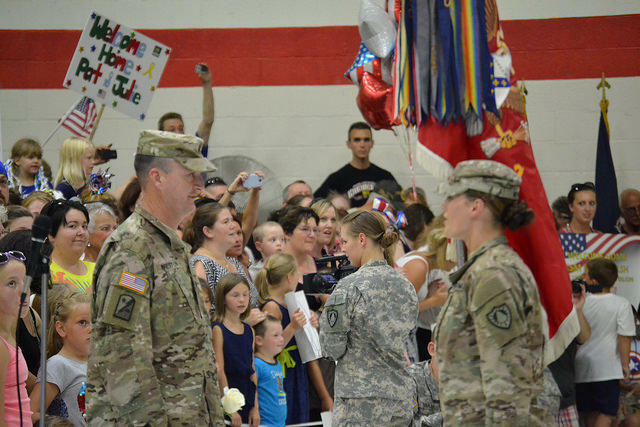 Mal Leary reports on the return of the remainder of Maine's 133rd Engineer Battalion from Afghanistan. Lt. Col. Dean Preston dismissed the soldiers in formation on the stage at the Augusta State Armory. The hot, humid day did nothing to curb the emotions as soldiers hugged, kissed and cried with family members and friends. They have been gone for 323 days, and for Capt. Adam Cote, it was a joyful reunion with his wife and five children. "All the grown-ups, we all look the same, but the kids - that really shows you how time has passed," Cote says. "Missed a year of holidays and school events, so looking to make that up." Cote, an owner of an energy company, says it's beach and amusement park time for him and his family for the next six weeks, as they try to catch up from this latest deployment. "This is my third deployment, but this has been the hardest because we have five kids now," Cote says. "And when I went to Iraq last time, Anna, who is right here, was nine, and we have had four kids since then. It was hard on my wife - very hard for her." The 133rd is a combat engineering unit. They were among the many military forces, both regular Army and Guard, that have been dismantling the huge military infrastructure of forward bases and logistical support facilities built over the more than decade-long war in Afghanistan. With its return, the Maine Army National Guard has hit an important milestone, says Maine Adjutant General James Campbell. "I think it’s since about 2005 this is the first time we have had everybody from the Army Guard in here Maine," Campbell says. It’s phenomenal. It’s a great feeling." We have a unit right now that is actually - it has a notification for deployment for the first part of next year," he says. "But we are going to savor this moment while we can." Since last August, the 133rd helped close three bases, destroyed two miles of military barriers, constructed three miles of safety barriers, recycled 38 miles of electrical wire, and developed acres of usable space for continuing support bases.